What happens in an Indo-Row class? What are the benefits? 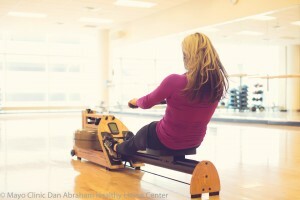 In an Indo-Row class you will workout on an indoor rowing machine called an ‘Indo-Row’. This state of the art rower uses actual water to provide resistance just like traditional outdoor rowing. With energizing music playing, certified instructors teach you how to use traditional rowing form and technique to build strength and cardiovascular endurance. An Indo-Row class is another way to build cardiovascular fitness. The beauty of this style of class is that it strengthens the upper and lower body in addition to the heart. It is also a great way to cross-train!